Wow the chocolate chip cookies look really good. I was planning to bbake today but realized I had no butter! Maybe tomorrow I will bake the cookies as they look quite delicious! So did you bake some cookies? I bet you made delicious ones. Oh I love cookies with nuts, too! :D Especially hazelnuts. ooh, your cookies look good! I'm a big Allrecipes fan too! But mine turned quite hard after a day, even keeping in an air-tight container. Isn’t that site very convenient now? Another thing I like about that site is that readers can post the food photos they took when they tried out the recipes. 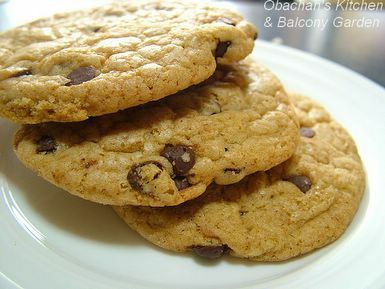 From your profile pic, I knew you are another cookie lover. ;) I just read on a couple of sites that storing a piece of bread with the cookies in the same storage container helps keeping cookies moist. Maybe this works?? I did make chocolate chipe cookies, but not the ones you had specified. I tried one of the recipes a friend wanted to bake, and well...they were terrible. I think it was the cappucino chips; I think they went bad. I did bake some really dense oatmeal cookies that were delicious, and were jammed packed with stuff...I have none left though, as DH and I ate them all. ;P But Hopefully I will be doing more baking soon.